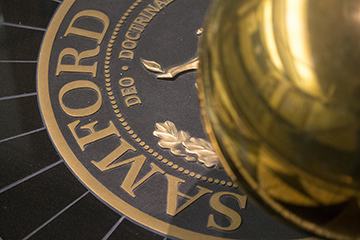 Samford University’s board of trustees approved new faculty and academic program nomenclature during its annual fall retreat Sept. 8–9 in Birmingham. Five new faculty members were approved in the College of Health Sciences. Trustees also approved a name change for the Department of Health Administration to the Department of Healthcare Administration in the School of Public Health. University officials said the new nomenclature more accurately reflects industry standards. Trustees approved the recently completed audit of the 2015–16 fiscal year. Drew Wagner, senior partner with PricewaterhouseCoopers, reported to trustees that PWC will be issuing a “clean report” of the audit. A total of 468 individuals were approved as members of 22 advisory boards for academic programs, athletics and the University Library. The advisory boards are important advocacy and support groups for the university, according to W. Randy Pittman, vice president for advancement. Members represent a wide diversity of professions, geographic regions and Samford connections. The retreat concluded with trustees participating in the official dedication and ribbon-cutting for Samford’s new College of Health Sciences facilities. Trustees had approved formation of the new college in 2013 and the purchase of the former Southern Progress Corp. headquarters in 2014 to provide facilities for the college. The renovated space includes about 223,000 square feet of state-of-the-art teaching and clinical facilities for the four schools in the college: Ida Moffett School of Nursing, School of Health Professions, McWhorter School of Pharmacy and School of Public Health. The next meeting of the board is Dec. 6.